Do you suffer from any of the following?? If you've answered "yes" to some or all of the above, you may be suffering from what we refer to in the dental industry as 'Temporal Mandibular Joint Disfunction' or TMJD for short. 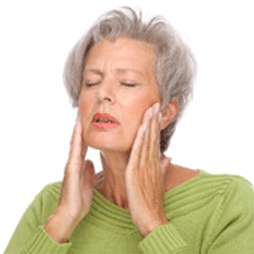 The temporo-mandibular joints (TMJ's) are the joints that hinge when we open and close our mouths. They also move from side to side in the action of chewing and forward & backward when we bite into something with our front teeth. You can feel these movements by placing your finger directly in the front of your ears whilst opening and closing your mouth. 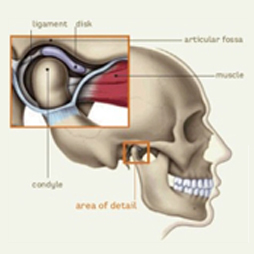 There are also lots of sets of muscles in the face, head and neck that work together to aid these movements - some muscles open the jaw while others close it, move it backwards or forwards and side to side. Our TMJ's are unique in that, not only are they the most constantly used joints in the body, they contain stress-absorbing pads made of acartilage-like material called 'discs'. We also have discs in our knees and spine but rather than staying in one position, the discs in our TMJs 'slide' which makes the jaw joint considerably more complex than in other parts of the body. The position of our teeth have the ultimate say on where our jaws close and many people have small errors in their bite which make them put their teeth together in a position of 'comfort' rather than a position that is right for the jaw. This means that the muscles relating to these jaw movements may begin to suffer from fatigue because they can never fully relax. 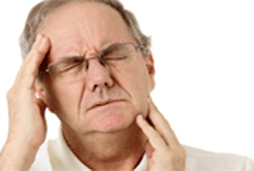 You could be aware of headaches, eye pain, neck and shoulder pain – or a combination of these symptoms, including toothache. Certain teeth/fillings are also more likely to break due to the 'points of stress' they are subjected to when there's a disharmony in your bite. 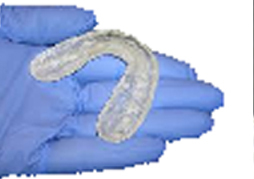 TMJ splints are made of plastic and work by taking the load off the jaw joint. 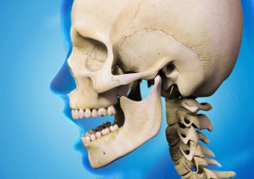 They are shaped to the individual and are designed to both line up the jaw and head correctly, and reduce the activity of the muscles that move the jaw joint. Instead of the teeth clamping together, they sit on the plastic platform, allowing the jaw to relax and return to the 'home' position thus enabling the jaw muscles to rest. The appliance is worn for a given period of time and adjusted/refined until it eliminates the bite disharmony and pain. 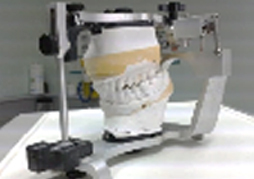 Being able to simulate your particular jaw movements on an articulator (right), means we are able to save you time in the dental chair as much of the study into your bite relationship has been carried out prior to the appointment. At Burwell we have been successful in helping many patients put an end to chronic discomfort using such appliances and offer a free 15 minute consultation to existing patients of the Practice. Once the initial diagnostic phase of treatment is completed and the TMJ pain eliminated, permanent treatment will then be prescribed to duplicate the effects of the appliance, e.g. equilibration or occlusal adjustment, orthodontics or restorative procedures such as crowns. In this way, the bite need not be permanently altered until the problem is accurately diagnosed via the splint. At Burwell, we are trying to address the cause of the problem rather than you having to deal with the symptoms and other complications TMJD can cause. If you think we can help, please give us a call.